An interpretation, from our perspective, of how each evening was received. This page is where you'll find a few notes and observation, from our perspective of course, about how the performances in 2017 were received. The Gang inside the Saracen's Head after the first performance - 1st November. Photo: Duncan Broomhead. Well the first night has been and gone. A midweek night so we expecting it to be on the quiet side and that indeed was the case -with the exception of the Black Swan. 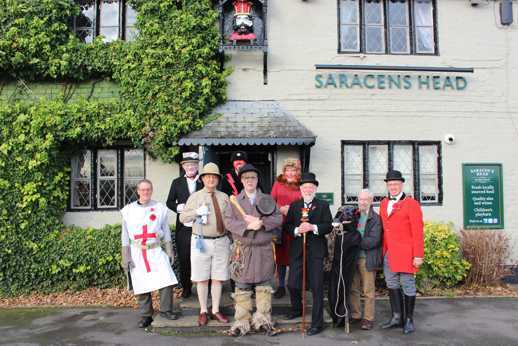 We started as is usual each year at the Saracen's Head at 8.30, and whilst it was quiet there some people there to watch it, including the new manager. After a group shot we then departed to the other side of Manchester Ship Canal to the Black Swan at Hollins Green. We performed just prior to the quiz starting so we had a very good audience watching. From here back over the canal to, well onto the other side of the Bridgewater Canal as well, to the Jolly Thresher. It was again quiet and as is usual we arrived just as people were leaving that reduced the audience somewhat further! Perform we did though to those left. From here back across the Bridgewater canal to the Vine where it was just us quiet. The feature being that Beelzebub, after having 'stolen' one beer, was offered another drink, a Gin of some sorts, that was also duly downed! So with the first night done we now go into Knutsford on Friday for our second night of Souling. For our second night we went into Knutsford starting with the Builders Arms. We'd miss this pub out last year as the pub had been getting a bit quiet, however after a refurbishment and a new Landlord we revisited this year and a very good start to the evening it was. Loads of people in and a very good reception. From here it was into the center of town and the Cross Keys. There was a live band on and we'd arranged that we would slot in to do a performance in a break, however the bar staff knew nothing of our coming, and with the band in full flow we decided to give it a miss. We therefore rounded up off the people who'd come to see us and went to our next pub, the Rose & Crown a couple of doors down the street. Here, a busy pub and a well received performance. 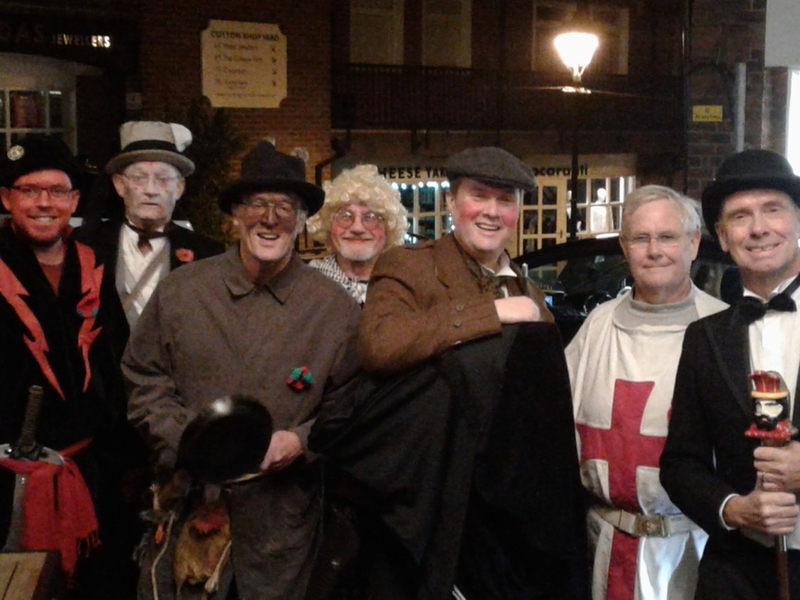 As we'd now missed one pub out, and we had tentatively arranged to perform in the Freemasons should we have time, after a quick check with them that all was OK for us to perform we duly headed off in that direction. A small, however a cosy pub with enough people in who all enjoyed it immensely. A good replacement. Half way through the evening and it was off to the Tap and Bottle. A wonderful place with the bar downstairs and the seating upstairs and one where we're always welcome. The layout involves us singing the introduction song at the bottom of the stairs then us all heading up in turn to perform. And a more difficult task to get the Driver and Horse up there on cue! Always and excellent venue to perform and it was no exception this time, made all the more enjoyable by a drinks round 'on the house'. Splendid! Thank you very much. The next was the White Bear where in the past we've always seemed to catch the pub in a 'thin' patch. Not this time. It was full. And the Landlady who's always welcomed us to perform actually managed to see it this time as she'd missed it many times in the past. It therefore was an excellent atmosphere and everyone very complementary of the 'sight' they'd just witnessed. The gentleman who was on the receiving end of Beelzebub's dire need for another drink wanted a picture of us all so it was a quick group shot outside before it was again drinks on the house. As always we'd like to extend our thanks for the welcome. So, moving onto the Lord Eldon for the last of the evening. It's always a nice cosy pub and always well received, perhaps not as many in as usual but nevertheless an excellent end to the evening. Our third night out saw us heading into Lymm via Statham but starting off at the Wheatsheaf in Agden. There was a large organised bonfire being held in Lymm this night so we were wondering how busy it would be, and hoping there'd be in influx of people into the village once it was finished. The Wheatsheaf had a reasonable number inside, in a way what was to be expected, and these mainly diners. It was a good start to the evening with an attentive audience before heading into Statham and The Star. Only a handful of people in this pub, and some of those had come to see us. A situation that gives the performance a different feel, a more homely approach. From here it was off into Lymm itself and four pubs all in walking distance, staring at The Bull's Head, the one we'd usually finish at, however for a number of reasons we decided to change things around a bit this year. It was quite busy, with a number of people coming to see us and others wondering what on earth was going on. A good one. Two pubs next, opposite to each other, first the Saddler's Arms and the usual good reception there, then across the road to the Brewery Tap. Here normally we'd only get as far as the front room as it usually quite busy. This time however as it was quieter so we headed in further and did the play in the back room. Generally we were finding that the large influx of people we were expecting after the bonfire hadn't happened. In fact Lymm we very quiet. The last venue was the Spread Eagle where Nic the landlord had offered us a home when the Saracen's Head had closed for a while. A nice finish to the evening, although as with the previous pubs, nothing like as busy as we'd normally find it. A few day's rest now then the last three nights finishing with the full day's Souling and the last performance at the Saracen's Head on the 11th November. The forth night is the first of three nights on the run to finish in Warburton at the Saracen's Head on Saturday. This night however saw us start in Sale then move to Urmston and Flixton. The first pub was a new pub to us, well one we'd not done for 30 or so years, Jackson's Boat. This is about as close to the River Mersey as one could get a Cheshire Souling play before ending up in Lancashire. 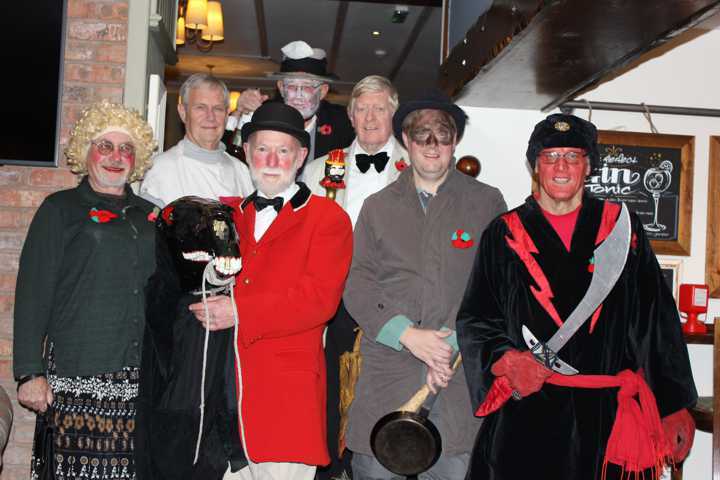 There had been a pre-arranged fireworks evening there run by the local Land Rover club and we performed after the fireworks had finished and everyone was back in the pub. Needless to say with a good audience there it was a good start to the night, especially after being bought a drink by the landlady. From here it was then to the new pub we introduced last year, The Bridge Inn in Sale. What a welcome that was. There was an instantaneous round of applause as soon as we'd finished the opening song, the first time that has happened, even though it was not one of our better renditions of it! There were numerous people who'd come along to see us so needless to say it was another excellent reception, and again resulted in a drink being bought for us. So, off to Urmston now and the Prairie Schooner first. There were a few more people in that we'd experienced in previous years, and with them being split between the front and rear rooms, most of the play was conducted in the space between. It was therefore, very well received by all. The second pub in Urmston was the Steamhouse in the old station buildings. It's always a good venue to perform in is it has splendid acoustics. It's also always well received, and although a bit quieter than usual, this was again the case. The last one for the night was the Church Inn, Flixton, where we perform after the Quiz. This was also a bit quiet, however it was just as enjoyable and a fitting end to what was an excellent evening and one again the landlord looked after us with a round of drinks at the end. A very good start to the last three day of Souling before heading into Hale and Altrincham tomorrow. This tour starts quite early at the Greyhound in Ashley as it has a good early evening clientel. After a few panics of people trying to get there in the back-end of the evening commuter traffic, not helped by accidents, we did eventually get started at the alloted hour. Whilst there were fewer in that usual, everyone was attentive with people coming from around the back to wath us as well as a few who'd come specially to see us It was a good start. Into Hale now and the Midland Hotel, a new one to us last year. A bit quieter than last year, and perhaps one or two not taking any notice at first, but it ended up being in the trend of 'a good'un'. Altrincham next where a regular, the Market Tavern was first on the list. This year we were again performing after the band for the night had done a sound check and before they started. Whilst it was a slightly smaller audience than previous years it was well received, and resulted in a beer all round for us from the landlord. After that it was down the road to the Malt Shovels, a smaller pub so the usual homely performance there. Last in Altrincham was Costello's, a Dunham Brewery pub, and a much more modern pub than the previous two. It can be a bit noisy in there and that was the case this time, however we won in the end! Last now it was off into Timperley and the Quarry Bank. Again it can be noisy at this time an a Friday night so as always we end up playing to those in the immediate vicinity. A good night all round and hopefully setting us up for the last night. So this is it, our last day of Souling for 2017. We all met at the Saracen's Head at lunchtime and after eating there, and after the obligatory photo under the 'Saracen's Head', we headed out to Warburton Church to perform at the Autumn Fair. It's always a great pleasure to perform for the community here and the church is such a splendid venue, both visually and acoustically, such that it gets us off to such a good start for the day. Before we continued however, we had a couple of hours to kill so it was a walk back up the road to the Saracen's Head to partake of some more light 'refreshment'! First on the list for the teatime/evening session was the Black Swan in Hollins Green. We do this on the first night as well as it's such a welcoming pub and has a completely different clientele between the two evenings. An excellent start to the last session. Back into our bus for the night and back across the Manchester Ship Canal and onto to the other side of the Bridgewater Canal. Yes, canals are worse that rivers for impeding ones progress in this area!! The Swan with Two Nick at Little Bollington is first and whilst quieter this time it's always a nice homely feel. From here to the Old No3. A new couple are running the pub after it went through a bit of a 'dull' time, including being open and closed a few times over the last few years. We weren't sure what to expect, however there were a few in to make it all worthwhile and we were made very welcome. Hopefully the No3 can now be back on the list for future years. Back to the other side of the Bridgewater Canal and into Dunham and the Rope and Anchor. Always a bit tricky here as it's a spread-out sort of layout, and whilst there were many in it was difficult to play to them all at once. Onto the Axe and Cleaver next (and the other side of that damn canal again). A good few in here, more that usual, such that we had a very good reception. Alway difficult when you're performing at an eatery trying to avoid those just wanting to enjoy their meal such that we were asked to keep clear of one table. However at the collection that table was very generous and had enjoyed the play. Two to go. Across the Bridgewater Canal - twice - to get back to Heatley and the Green Dragon. Again dissapointingly less in that we've seen for many years but still it got us nicely winding up for the last one. As always, we're very welcome by the landlord who's parting comment is "same time next year then?!" Probably more of a statement that question. So down the road to the Saracen's Head and the last one for this year. After a few quiet pubs this evening we were full of nervousness as we weren't quite sure what we were to find here. Fear not - the place was really full with music already in progress. As soon as that stopped off we went with the opening song followed by the play and finishing song. A couple of minor hic-ups allong the way - it'd been a long day - but what a reception and finish to this years Souling. Superb. And so that was it for another year, but not before we just about saw Sunday in with the rest of the night filed with music and song. Dates for your diary will be next years performances on the 1st, 2nd 3rd, 8th and 9th of November to finish on Saturday 10th. This will be 40 years since the revival of the play so we're aiming to have more of a special session on the last day, hopefully getting hold of those that have been part of the play over the years. This page updated: 14th November 2017.